When you live in a city, you don’t only become part of it; it becomes part of you. I first had the idea for this post in a shower. And for weeks it has been brewing in the back of my mind. Partly because I have been feeling tired recently, which is no good for writing (as the jumble of words that is my Selfish post suggests). And partly because I like ideas to sit in the hope that, left to their own devices, they will crystallise into something good. Why now? Well… for the first time in weeks, I feel rested. Conditions are perfect. (Small detour: this phrase is taken from a hilarious New Zealander duo. I don’t want to distract you, but this is they.) I am sat at a comfortably large rectangular wooden table – a) I don’t like using my laptop on a table of any other shape. It just doesn’t feel right. b) A small table just pisses me off. c) Wood is nice. I have a glass of water to one side (it is important to keep hydrated), an iced espresso (no sugar, no milk) to another. A light wind is blowing in my face (I strongly dislike air conditioning, which – as you can imagine – is not the most convenient preference in the uber urbanised centre of a tropical country.) And the idea for this post has somewhat matured during my morning drive. By ‘matured’, I don’t mean crystallised into something good. I don’t know that yet. By the end of this post maybe. You never quite know where writing will take you when you don’t plan it. But so far I’m taking the spontaneous approach to writing on here. I like the idea. I’d like to be good at it – practised spontaneity, if you will (brownie point to me for writing an oxymoron; one for you too if you know what it means – a useful and most fascinating word, ‘oxymoron’). Now that I’m flowing (my apparently irrelevant introductions do serve the purpose of getting me rolling. No, I don’t always ramble in my introductions. Only on this blog. Part of the spontaneous writing thing – or so I claim. ), let’s get to the topic at hand. I have lived in three cities in my lifetime: London, Paris, Bangkok. In some longer than others, but never more than 2 years, which is mathematically curious for a girl of 24. No, I haven’t been changing cities every 2 years. I am merely discounting away my childhood. Anything up to the age of 18 I delegate to the ‘childhood’ box – I wasn’t living back then; I had no agency. I had a happy childhood, but for personal and circumstantial reasons, I cannot say I lived it. From this year (August, to be exact), I will be confined to Bangkok for six years. (Scholarship condition, I’ll get into that some other time.) This scares me. And trying to figure out why has long occupied my thoughts. I don’t know if I’ve figured it out, or if I ever will. But this post is an attempt to set out a plausible candidate. My guess is that Bangkok (and, by extension, Thailand) is a very different world from the one I’ve known in Oxford, London, and Paris – the world abroad I’ve got used to living in, and one I’ve come to love. I don’t dislike Bangkok, I just don’t like it. The Bangkok world is foreign to me. And not in a good way. It’s ironic isn’t it? You take a scholarship to go study abroad, and at the end of six years, your native country and city has become completely foreign to you. I find it fascinating. But at the same time daunting, given my six years to come. What is it about Oxford, London, and Paris that has alienated me from my native city? I think that’s the question to ask. And the answer is by no means easy to find; these are very different cities – physically, culturally, linguistically, geographically, as those who’ve lived in all three would no doubt be able to attest. I think the answer to the above question lies not so much in the cities themselves, but in the unique relationship I’ve formed with each city. The relationships that have forged me into the person I am now. You see, I believe a relationship always exists between you and the city you live in. You may not always be conscious of it, but it is there. And this relationship is very intimate. You spend all your time in your city, you do everything in it; and because all your activities, your thoughts, your relations, etc. are carried out within the physical, social, economic, political, and cultural context of the city, your identity (which consists of your activities, thoughts, relations, etc.) ends up at least partially reflecting that of your city. In short, when you live in a city, you don’t only become part of it; it becomes part of you. When I left Bangkok for Oxford in 2007, I was one person. I came back to it six years later a very different one. Of course, this is partly due to maturity, growing up. But a large part of it is due also to the urban experiences that have changed me. Actually, I don’t think the two are separable. I have matured in the context of my urban experiences, and so my maturity must to a certain extent reflect my urban context. The grown-up me carries with her residues of Oxford, London, and Paris. And these residues, which over a period of six years have ingrained themselves into my personality, are what puts me off Bangkok. It’s not that I like the three cities equally. I grew bored of Oxford after two years and London is taking its time to grow on me, while I fell in love with Paris instantly. But, on the whole, I loved my life in all three, in my world abroad. Life there agrees with me. And I yearn to relive it. But you don’t always get to be where you want in life. Apologies for sounding like an economist, but free meals do not exist. And the very thing that gave me the opportunity to experience the wonderful world abroad is now confining me to the world of Bangkok. And I literally have to live (with) it. I asked a friend the other day what his favourite city was. And he told me: whichever city I’m in, because I will myself to like that city. It’s part of his rationalisation system. His answer got me thinking. Life is black and white and a lot of grey. There must be something I can find about Bangkok that will endear me to it. I mean, I didn’t like London – and I was happy enough for all of three years. Why do I not like Bangkok? It’s certainly different from my world abroad, but what about it that alienates me so? I’ve come up with a few candidates: the heat, the traffic, the people (no offence), the rigid social strata, the culture, the malls, the ubiquity of Thai (not a fan of the language – never have been, probably never will be – it’s intolerably long-winded. The lack of full stops alone drives me mad.). The list continues. You can always find fault with something, and not liking it helps a lot in that endeavour. 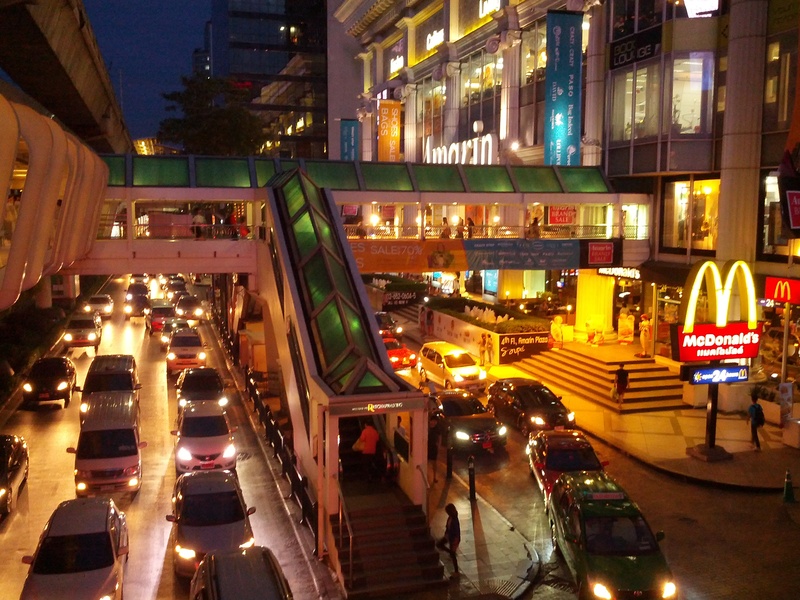 But I think I’ve found it, the decisive factor that divides my two worlds, the part of me that I inherited from my world abroad that is incompatible with Bangkok – a fundamental need that Bangkok does not satisfy, if you will: I cannot walk here. Sounds trivial to you? It probably is to most people. But not to me. I like walking. I really do. It clears my head. Makes me happy. There’s nothing I love more than going on walks in my city. I had a bike in Oxford, and I rued it. It was convenient and practical, but it deprived me of walking as a form of personal transportation. I briefly had a bike in London (the same bike). But I didn’t like not being able to stroll, stop to take pictures, look at the people around me. (Also I realised I was too reckless a cyclist to make cycling in London safe, and decided to remove the risk factor.) My fondest memory of Paris was walking home (14th) from my salsa class in the 11th. I think it took me almost three hours. And I felt desperately lost at times. But I loved it. You can’t walk in Bangkok. It’s too big (a problem I also had with London – in fact, I strongly suspect that its size is the main reason I prefer Oxford and Paris to it). And public transportation is too inadequate. In London or Paris, you can always take the tube or the métro and walk it from there. But not Bangkok. At least not from where I’m living. I live outside Bangkok. Distance-wise it’d probably be about Wimbledon to Central London (very roughly). Currently I have one viable mode of transporting myself into the city: drive. And the traffic (for which Bangkok is notorious) makes this a drag. I have to leave very early and come back very late if I don’t want to waste good money on petrol. But this isn’t what bothers me. I don’t mind getting up early as long as I get enough sleep. I’m most decidedly a morning person. And waking up early (like today) puts me in a good mood for the rest of the day. What bothers me is the drive. Not driving. I love driving. But I don’t like having to drive in my city. I want to be able to walk into it, in it, around it. I can’t live in a city from my car. So far, living in Bangkok has been me living in my car, which happens to be moving around in Bangkok. And this is no good. Not for me. I need to walk in my city. See it, smell it, hear it. You may find this a bit weird, but that’s pretty much the only way known to me of integrating into a city. I will never become a Bangkokian the way I was an Oxfordian, a Londoner, or a Parisian if I don’t walk in it. And it’s not just going for walks from time to time. It’s being able to walk on a regular basis, as part of my daily routine. I don’t even mind the heat, the sun, the getting tanned/black/burnt/sweaty. I just want to walk. But Bangkok doesn’t lend itself to that. Not so far. Maybe it will when they finish building that sky train to my house. Then at least I’ll be able to take the train in. I can commute. I can read while I commute, gaze out at the city, observe fellow commuters. But there are enough legal and political hurdles before the project’s finish line for me not to hold my breath. So, what am I going to do? In life, one must be flexible. And I’m going to try to see how I can make Bangkok compatible with me, or me with it. Today I’m going for a long walk. Into Old Bangkok which I’ve always found quite charming, but never made the time to explore. I know I like boating up and down Chao Phraya river. I’ll do that today. In the hope that I can start to form a positive relationship with Bangkok. So that, in six years, I can look back with fond memories. However much I want to leave, I also want to live. And more. Because life is to be lived. Wherever you may find yourself.